Shroyer Pools & Spas offers a comprehensive selection of quality hot tubs and the supplies to keep them well maintained for years to come. We offer premium hot tubs by Bullfrog Spas, universally recognized as one of the top brands in hot tubs, along with quality spas by Freeflow that provide a great value. 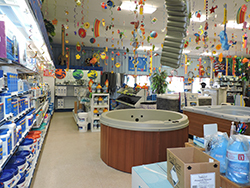 Whether you're looking for a great way to relax after a long day, a place to escape, or the perfect way to build strong connections with loved ones, come visit our store to see how a hot tub can be an incredible investment for your home. Bullfrog Spas are the only hot tubs available here in Muncie and the world that can be completely personalized to fit your unique body and your unique lifestyle. 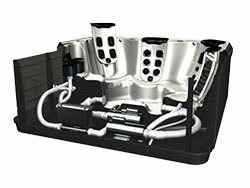 Bullfrog Spas feature the JetPak Therapy System, a system of modular and interchangeable seat backs, each with a different array of jets that create uniquely therapeutic hydromassage experiences. You set up your Bullfrog Spa with the JetPaks you like, that feel best to you. You can place your favorite JetPak in the seat that best accommodates you and allow other family members to do the same. And you can change JetPaks at any time now or in the future. Bullfrog Spas are also engineered to last and designed to impress. Other conventional spas, even many high-end brands, build their spa support structures from wood or metal that can rot, rust or corrode. Bullfrog’s support structure, called the EnduraFrame is made from a durable hi-tech composite that will provide reliable hot tub relaxation for years and years. And each model is beautifully designed to compliment any home and landscape. 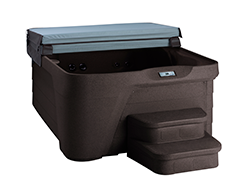 Freeflow Spas plug into any standard 110v outlet. Simply add water, plug in your hot tub and enjoy! 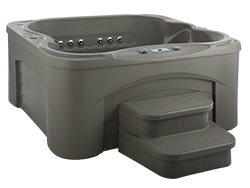 Freeflow spas are built for value, the manufacturing process allows for affordable hot tubs starting at just $2,699*. In addition to being the only fully personalized spa on the market, Bullfrog Spas are also the leaders in energy efficient spa operation. According to data compiled by the California Energy Commission, Bullfrog Spas consistently use less energy that competing spas in the same size range. This saves you money on your energy bill, which can add up to thousands of dollars in savings i n the long run. Stop by today to take a look through our hot tubs and talk to one of our staff members about what would be best for you. If you have any questions, feel free to call us at 765-284-1131 for assistance. We look forward to hearing from you!